Guillermo Kuitca knew from an early age that he would be an artist. Born in Buenos Aires, Argentina in 1961, his parents--professionals descended from Russian Jewish immigrants--were very supportive. He studied almost exclusively with Ahuva Szlimowicz (a surrealist trained in the tradition of Batlle Planas) and had his first solo exhibition at age thirteen, at the storied Galería Lirolay. After seeing Pina Bausch's Tanztheater Wuppertal perform in Argentina, he traveled to Germany to work briefly with her troupe. Thus, the theatrical has had a lasting influence. Kuitca's large-scale paintings of the early 1980s depicted cavernous, sparsely furnished interiors in which Lilliputian characters gesture hieroglyphically. Around 1987, Kuitca began developing paintings inspired from floorplans. Apartment configurations, architectural diagrams of hospitals, stadiums, prisons, and theatres, street plans of cities, and maps of territories unknown to the artist--including parts of the United States, Europe, and Asia-- appeared in his artwork. In a pivotal 1988 series, the artist incorporated sections of his map-imagery on tufted daybeds, and exhibited groups of these horizontal works gathered in the gallery center. The maps are lovingly drawn but not necessarily truthful; they are crafted in softly solarized black and whites, fleshy ivories punctuated with red, atmospheric blues. Streets can be lined by bones or hypodermic needles; hallways edged by landing lights. His concern with draftsmanship has led to series dealing with the crown of thorns, genealogical charts or family trees, the Tablada Jewish cemetery near Buenos Aires, historical marble floor motifs, and glowing theatre interiors. More recent developments include altered digitized prints and, as exhibited at the 2007 Venice Biennale, tondos and large scale works which incorporate various painterly and graffiti-like notations browsing art history. Kuitca remains based in Buenos Aires, where he founded an intimate and supportive studio program for emerging Argentine artists. Kuitca's family was not directly affected during the Dirty War. In Argentina during this period, the military dictatorship (1976-1983) disappeared 30,000 of its own citizens: kidnapping, torturing and killing anyone considered subversive or dangerous, intellectual, or outspoken. This culture of fear and repression bred a damaged society; everyone knew someone who had disappeared. The lingering aftereffects of such surveillance, containment, and malevolent control can also be read in Kuitca's work. 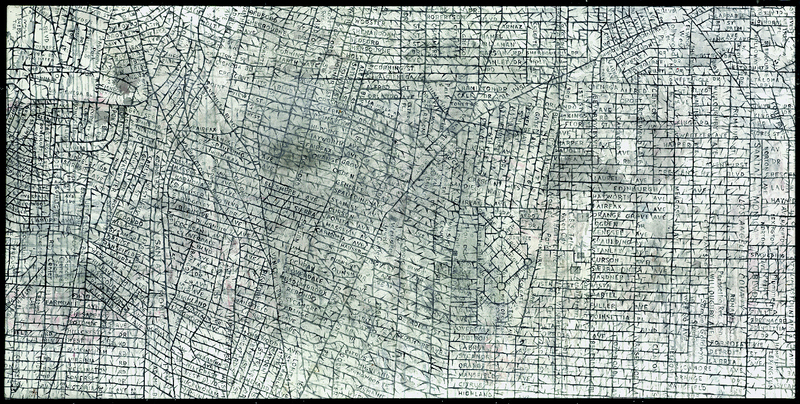 His delicate surfaces, including Untitled (L.A.), function like palimpsests. Examining his labyrinthine surfaces, one notices that instead of depicting the busy circulation of healthy culture, these maps are emptied, absent, enigmatic. They refer to spaces and places but re-territorialize them, not pointing us to the real world and its actual pathways, but rather summoning us back into our own memories and associations. The City of Angels here is not palm trees and blue skies, but rather a smudgy noir vision, seen through the smog. The works point to the duality of inner life and the external world. While maps of territories might seem to imply our projection and conquest and over the world, Kuitca's oeuvre circles us back to our own internal world, rife with discontinuity, displacement, and frustration over our inability to order it. Guillermo Kuitca's works walk slowly through these spaces. And the artist remembers that Pina Bausch, in theorizing her form of modern dance, had once said that sometime walking is enough. Deborah Cullen, Director of Curatorial Programs, El Museo del Barrio, New York.